LTN allows the child time to adapt to the nursery and permits the parent to attend classes with the child until the child is content and familiar with the teachers and students and is ready to settle in his home away from home. LTN encourages individuality and supports and values the uniqueness of each child. Our teachers are trained to be aware of each child’s interest, talents and level of intake. Our curriculum is based on the Learning Trail Model (LTM) which revolves around six main areas of focus: The child, culture, environment, spirituality, health and creativity. We believe that these six areas are the main composites of life itself. 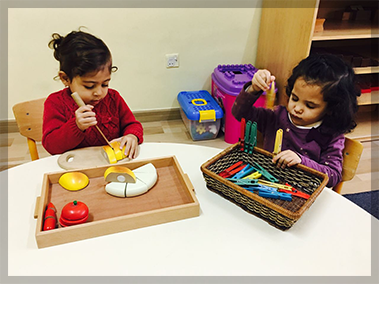 We have chosen to implement the Montessori Method of teaching because it respects the child as an individual, allowing our children to explore their surroundings and encourage self-initiation. The Environmental Program (EP) adds ecological awareness, molding a well-rounded individual. LTN focuses on teaching Arabic as it is our mother tongue. We believe that it is of great importance to teach our children their mother tongue, so they may express themselves confidently and develop all their communication skills in a comfortable manner. Arab customs, traditions, culture and identity, as well as good habits and manners, are celebrated to instill pride in who we are. We also build awareness in our children of their physical needs to keep a healthy lifestyle. We strive to keep creativity alive in every child as a means of expression and celebrating life. Our classrooms are sunny and friendly, designed and equipped with the proper Montessori tools for learning, bearing in mind that a crowded or chaotic classroom can cause stress and dissipate a child’s energy and concentration. Keeping the safety aspect first and foremost in mind, the outdoor play areas are kept as simple and natural as possible. We also have an organic farm set-up where children work with the land and farm animals. Our sensorial garden is an essential part of the outdoor experience. The main criteria for selecting our teaching team, is the love for children, patience and readiness to answer and encourage inquisitive minds. Our team receives ongoing training and workshops throughout the year. We believe that you, as parents, also play an essential role in the development of the community of our school through your presence as volunteers at social events and celebrations that take place at LTN. Your support and encouragement are of vital importance to your child’s first schooling experience.